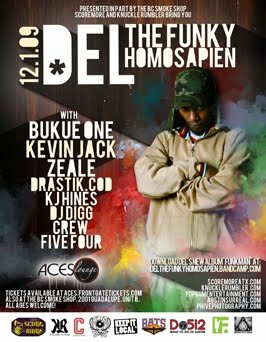 From the giveaway coming soon department... Knuckle Rumbler peeped us to the Del tha Funkee Homosapien show @ Aces Lounge on Tuesday, Dec 1st! In true Knuckle Rumbler fashion, some heavy hitters will be out for this show: Bukue One, Kevin Jack, Zeale, Drastik.Cod, KJ Hines, DJ Digg and Crew54! Check back soon for a special giveaway! Teren Delvon Jones (born August 12, 1972 in Oakland, California), better known as Del tha Funkee Homosapien, is a hip hop artist. Cousin of renowned rapper Ice Cube, Del began his career writing lyrics for Cube's backing band, Da Lench Mob. In 1991, with the help of Ice Cube, Del released his first solo album, I Wish My Brother George Was Here, at the age of 18. The album was a commercial success, largely due to the popularity of the hit single, "Mistadobalina". Ultimately Del, who was not pleased with the limited musical range of the album, took matters into his own hands, and severed his production-artist relationship with Ice Cube for his next album, No Need for Alarm. Del is considered a member of the Native Tongues Posse according to the myspace page. No Need for Alarm also saw the introduction of the famous Oakland clique Hieroglyphics, whose original members included the widely acclaimed Souls of Mischief (Opio, A-Plus, Phesto and Tajai) Casual, Pep Love, Del, and producer Domino. No Need for Alarm was a bold move on Del's part as it allowed him to develop, display, and solidify his unique style as an MC, and also helped to expose both the regional Oakland sound of hip hop, as well as the freestyle based, "golden era-97" style of hip hop being expanded at the time.